High fidelity—or hi-fi or hifi—reproduction is a term used by home stereo listeners, audiophiles and home audio enthusiasts to refer to high-quality reproduction of sound to distinguish it from the lower quality sound produced by inexpensive audio equipment, or the inferior quality of sound reproduction that can be heard in recordings made until the late 1940s. Bell Laboratories began experimenting with a wider range of recording techniques in the early 1930s. Performances by Leopold Stokowski and the Philadelphia Orchestra were recorded in 1931 and 1932 using telephone lines between the Academy of Music in Philadelphia and the Bell labs in New Jersey. Some multitrack recordings were made on optical sound film, which led to new advances used primarily by MGM (as early as 1937) and 20th Century-Fox Film Corporation (as early as 1941). RCA Victor began recording performances by several orchestras using optical sound around 1941, resulting in higher-fidelity masters for 78-rpm discs. During the 1930s, Avery Fisher, an amateur violinist, began experimenting with audio design and acoustics. He wanted to make a radio that would sound like he was listening to a live orchestra—that would achieve high fidelity to the original sound. After World War II, Harry F. Olson conducted an experiment whereby test subjects listened to a live orchestra through a hidden variable acoustic filter. The results proved that listeners preferred high fidelity reproduction, once the noise and distortion introduced by early sound equipment was removed. Reel-to-reel audio tape recording, based on technology taken from Germany after WW II, helped musical artists such as Bing Crosby make and distribute recordings with better fidelity. In the late 1950s and early 1960s, the development of the Westrex single-groove stereophonic record cutterhead led to the next wave of home-audio improvement, and in common parlance, stereo displaced hi-fi. Records were now played on a stereo. In the world of the audiophile, however, the concept of high fidelity continued to refer to the goal of highly accurate sound reproduction and to the technological resources available for approaching that goal. This period is regarded as the "Golden Age of Hi-Fi", when vacuum tube equipment manufacturers of the time produced many models considered endearing by modern audiophiles, and just before solid state (transistorized) equipment was introduced to the market, subsequently replacing tube equipment as the mainstream technology. Listening tests are used by hi-fi manufacturers, audiophile magazines and audio engineering researchers and scientists. If a listening test is done in such a way that the listener who is assessing the sound quality of a component or recording can see the components that are being used for the test (e.g., the same musical piece listened to through a tube power amplifier and a solid state amplifier), then it is possible that the listener's pre-existing biases towards or against certain components or brands could affect their judgement. To respond to this issue, researchers began to use blind tests, in which the researchers can see the components being tested, but not the listeners undergoing the experiments. In a double-blind experiment, neither the listeners nor the researchers know who belongs to the control group and the experimental group, or which type of audio component is being used for which listening sample. Only after all the data has been recorded (and in some cases, analyzed) do the researchers learn which components or recordings were preferred by the listeners. A commonly used variant of this test is the ABX test. A subject is presented with two known samples (sample A, the reference, and sample B, an alternative), and one unknown sample X, for three samples total. X is randomly selected from A and B, and the subject identifies X as being either A or B. Although there is no way to prove that a certain lossy methodology is transparent, a properly conducted double-blind test can prove that a lossy method is not transparent. Doug Schneider, editor of the online Soundstage network, refuted this position with two editorials in 2009. He stated: "Blind tests are at the core of the decades’ worth of research into loudspeaker design done at Canada’s National Research Council (NRC). The NRC researchers knew that for their result to be credible within the scientific community and to have the most meaningful results, they had to eliminate bias, and blind testing was the only way to do so." 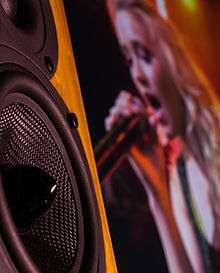 Many Canadian companies such as Axiom, Energy, Mirage, Paradigm, PSB and Revel use blind testing extensively in designing their loudspeakers. Audio professional Dr. Sean Olive of Harman International shares this view. In addition to spatial realism, the playback of music must be subjectively free from noise, such as hiss or hum, to achieve realism. The compact disc (CD) provides about 90 decibels of dynamic range, which exceeds the 80 dB dynamic range of music as normally perceived in a concert hall. Audio equipment must be able to reproduce frequencies high enough and low enough to be realistic. The human hearing range, for healthy young persons, is 20 Hz to 20,000 Hz. Most adults can't hear higher than 15 kHz. CDs are capable of reproducing frequencies as low as 10 Hz and as high as 22.05 kHz, making them adequate for reproducing the frequency range that most humans can hear. The equipment must also provide no noticeable distortion of the signal or emphasis or de-emphasis of any frequency in this frequency range. ↑ Hartley, H. A. (1958). "High fidelity". Audio Design Handbook (PDF). New York, New York: Gernsback Library. p. 200. Library of Congress Catalog Card No. 57-9007. Retrieved 2009-08-08. I invented the phrase 'high fidelity' in 1927 to denote a type of sound reproduction that might be taken rather seriously by a music lover. In those days the average radio or phonograph equipment sounded pretty horrible but, as I was really interested in music, it occurred to me that something might be done about it. ↑ Spanos, Aris (1999). Probability Theory and Statistical Inference. Cambridge University Press. p. 699. ISBN 0-521-42408-9. ↑ John Atkinson (2005-07-17). "Blind Tests & Bus Stops". ↑ Robert Harley (2008-05-28). "Blind Listening Tests are Flawed: An Editorial". The Absolute Sound. Retrieved 2011-09-29. ↑ Doug Schneider (2009-05-01). "The Misinformed Misleading the Uninformed - A Bit About Blind Listening Tests". GoodSound!. Retrieved 2011-09-29. ↑ Doug Schneider (2009-06-01). "A Bit More About Blind Listening Tests (6/2009)". GoodSound!. Retrieved 2011-09-29. ↑ Dr. Sean Olive (2009-04-09). "The Dishonesty of Sighted Listening Tests". Retrieved 2011-09-29. 1 2 3 Fries, Bruce; Marty Fries (2005). Digital Audio Essentials. O'Reilly Media. pp. 144–147. ISBN 0-596-00856-2. Digital audio at 16-bit resolution has a theoretical dynamic range of 96 dB, but the actual dynamic range is usually lower because of overhead from filters that are built into most audio systems." ... "Audio CDs achieve about a 90-dB signal-to-noise ratio." "Most adults can't hear frequencies higher than 15 kHz, so the 44.1 kHz sampling rate of CD audio is more than adequate to reproduce the highest frequencies most people can hear. ↑ Eargle, John (2005). Handbook of Recording Engineering. Springer. p. 4. ISBN 0-387-28470-2. ↑ D'Ambrose, Chris (2003). "Frequency Range of Human Hearing". The Physics Factbook. Retrieved October 11, 2009.